Here are some ideas to help you control the chaos. 1. Get rid of all the junk you don’t need! We know you read our basement organization article and by now are an old pro at the methodical way in which you should be purging. Separate your things into “keep”, “donate”, “sell” and “trash / recycle” piles to get your belongings organized. Remember, you can get rid of all of your garbage easily by renting one of our garbage bins! 2. Create a floor plan or layout so you can keep like items together, such as gardening gear, sporting equipment and tools. If you can’t see the forest for the trees because there’s just too much junk, you may want to empty the garage first (there’s not much stuff in there because you’ve already purged right?) so that you have a blank canvas to start with. 3. If you’re a handyman (imagined or otherwise), you probably use your garage as a workspace as well. Installing a foldable or wall mounted workbench will help save space and still allow you to work on your two-year book shelf project. 4. Install wheels or make sure you have wheels on big tool boxes, workbenches and chairs so you can move them easily around the garage when not in use. a. If you own a lot of tools, put them in wall mountable tool boxes and install them on the wall. Just make sure you’re mounting them securely on studs as they’ll be pretty heavy. b. Pegboard is the MVP of the garage. It’s affordable, versatile and can be used to store almost anything you can think of. If you choose this route, make sure to secure heavier items with bungee cord for safety. c. For a sleeker look, mount slat walls rather than pegboard. Keep in mind that while they still offer the advantage of vertical storage space, they can be more expensive and a little less versatile because you’re limited to only hanging hooks on the horizontal tracks. d. Common bracket-supported shelving can also be mounted to your walls for items that are better suited for shelves like large bins and bags of fertilizer or seed. To get the best of both worlds, try adding a shelf above a slat wall or pegboard for more flexibility. 6. Use labelled plastic storage bins to help organize your garage. Before you head out and purchase these though, sort your items using cardboard boxes first. Once you have a better idea of the sizes and strengths of the bins you’ll need, you’ll find it easier to buy suitable bins. 7. Some garages have high ceilings because of the elevation of the home. Put that unused space to work by installing loft-like ceiling storage. You can build your own or purchase ones that even have pulley systems to make it easier to lift heaver items up onto them. Shelving like this can go a long way towards organizing your garage. 8. Re-purpose old filing cabinets or make sure to get locking cabinets for storage of hazardous materials so that your children can’t get to them accidentally. 9. Flash back to high school and install a set of lockers, metal or resin, and assign one to each member of family for organized storage of bike helmets, sidewalk chalk and other outdoor activity supplies. 10. For seasonal items such as your lawn mower or patio furniture, consider purchasing a storage shed to store these items so you have less clutter in your garage. 11. Have an athletic family? Use a wire wall basket for ball storage like this one. 12. Shoe racks or a mud station might be a good idea if your garage entrance is the one you use most often, as they will prevent dirt from coming into your house. Installing a coat hanger is also useful for hanging wet outerwear such as snow pants or rain jackets while they dry. 13. Move paint indoors as extreme heat and cold can damage it. 14. For safety reasons, never store propane tanks in your garage. They should be stored outdoors where any leaking gas can be allowed to dissipate. 15. Store paper goods like plates, napkins and the 100 packages of toilet paper that was on sale last week indoors, because they will attract insects. 16. Don’t put a running refrigerator or freezer in the garage. They use too much electricity when they’re not in a climate controlled environment. 17. This might be obvious, but don’t store pet food in the garage. Mice and other animals will be attracted to the smell and you’ll most certainly have more than your fair share of pets in no time at all! And that’s a wrap! 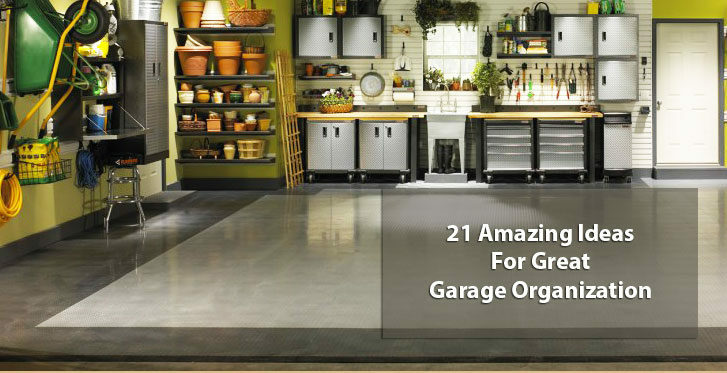 Hopefully you’re already planning your garage organization project after reading this. For more tips on organization and decluttering, follow us on Facebook!